I am sorry not to have been sending this to you before this moment but you can probably guess it is necessary to do many things in the week after Magny Cours and before my home soil race. Well, what a two weeks it has been! I am a five times world champion and the truth is finally sinking in all the way. What a party we had in France! I spent the night celebrating with Paulo, Luca, Jean, Rory, Luca and my lieblings darling, dimple cheeks. Yes, Ross. I don't remember when I have got so drunk before, I must have had at least five bottles of beer, and after that I was totally without the legs. After four beers I recall I am karaoke-ing in front of people to Tina Turner's 'Simply The Best', a song that I often train to. Then I thought of a little joke and I held onto the microphone. "If this was Juan-Pablo Montoya," I said and then I paused for effect. Comedy is becoming second nature to me now, "I would have to be singing 'Simply The Beast'." Much laughter is coming to me. As I was leaving, Jean Todt was on the stage singing 'Non, Je Ne Regrete Rien'. Though unlike the Ferrari Christmas party he was not wearing his Edith Piaf dress this time. The reaction to me the following week was most amazing. I am being touched all over by people. It really was quite fantastic. I realize I am touching people for some time, but after Austria it is nice to see it return. A great many are questioning what I am saying to Jean Todt on the podium at France and I have said before this is a secret to keep between the two of us. In all honestly, I have no idea what he is saying, there are klaxons going off, people are shouting, "Schumi! Schumi!" and he shouted something. I smiled and nodded but had no idea what he is saying. In no time afterwards we are meeting up in Hockenheim. Willi has presented me with a beautiful range of new caps, T-shirts and collecting items to approve. At our first driver briefing to introduce us to the track Jacques Villeneuve looked at my new 5 World Championships cap and 5-star T-shirt. He made the suggestion that I should also be offering my tifosis the chance to buy 5 World Championship toilet paper. He said he would be quite happy to buy many quantities and use it himself, which I find unusual. Perhaps there is something behind this suggestion that I am not reading. It is great to see a smile on Ralf's face again. He told me that the changes to his car have really been suiting him nicely and that he can be doing some good racing action with them, but I suspect he is spending less time with that woman. We are both enjoying seeing our tifosis 22 times more than last year with a 67-lap race. And that is not including the many extra laps we can perform in practice and qualifying. Willi is wearing this enormous smile across his face after the race. 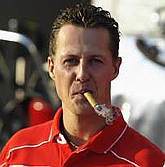 My first Ferrari win in Germany, I guessed, was the cause of his smilings. "No," he said, "I forgot to tell you. We have broken all records with sales of the Michael Schumacher air horn! With 67 laps now they all have to buy refills".